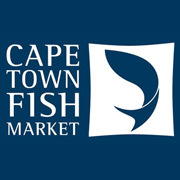 CTFM, a vibrant Restaurant, Fish Market, Teppanyaki & Sushi Bar with chic yet informal surrounding, brings a fresh taste of South Africa to its customers. The decor places strong emphasis on Cape Town's picturesque landscape and captures the soul of bygone days in various fishing harbours. This is done through the use of historical photographs, obtained from various Cape Town museums. The passion, pain and humility of the fishing community in their quest to not only get the best catch but to ensure a fair price for their labours is clearly evoked. This juxtaposed with the use of stainless steel throughout the restaurant emphasises the restaurant's clean lines and further compliments the furniture and finishings. The menu offers a wonderful combination of both South African and Japanese dishes. There's the old favourite fish and chips, the chic fresh oysters, the unusual Prawn & Avocado salad, the delectable Salmon Teriyaki and the classic seafood curry. The seafood platters come highly recommended and you can even pick your own ingredients from the fresh seafood displayed on ice. For those who aren't that partial to seafood, there is also a choice of meat & poultry as well as a number of vegetarian dishes. Children are also catered for.